This book will put fresh and fun, easy and age-appropriate skits at your fingertips! These 55 skits, most with casts of two to six players, are sure to fuel your young and middle school aged students’ excitement about performing. The simple sketches present drama in a fun, non-threatening way and require very little planning or memorization. Written by a middle school teacher, these skits have been successfully used in classrooms and address many student needs such as building self-esteem, memorization, reading, speech, and elocution. The simplicity and versatility of these skits make it easy for you to use in any number of ways. Read more...Quickly grab an appropriate skit for your drama class, insert a few minutes of drama into your regular classroom just for fun, or launch interesting discussions about topical issues like gossip or respect. The introduction includes tips on how to cast and stage a skit, as well as how to adapt them for different age levels and even special needs students. 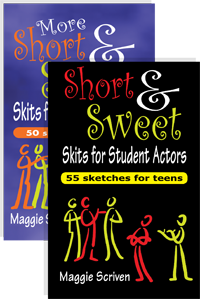 Based on the huge popularity of her first book, Maggie Scriven has developed another 50 sketches ideal for developing middle and high school-aged actors. The skits have casts of two to ten players and cover a wide variety of topics and drama styles, making these two- to four-minute sketches ideal for competitions, practice, or comedy revues. Each short play provides the topic and a cast list, including short descriptions of each character, to make choosing the skit easier. All the topics are highly relatable for teens, as you can see from these sample titles: Drivers Ed, Un-Reality Show, Sibling Rivalry, TV Addiction, Compu-Speak, Getting a Job, Prom, and Don’t Tell Mom. SPECIAL OFFER! Buy both books for $27.00! Package pricing will not be reflected in your shopping cart, but we will manually adjust your invoice when we process your order.